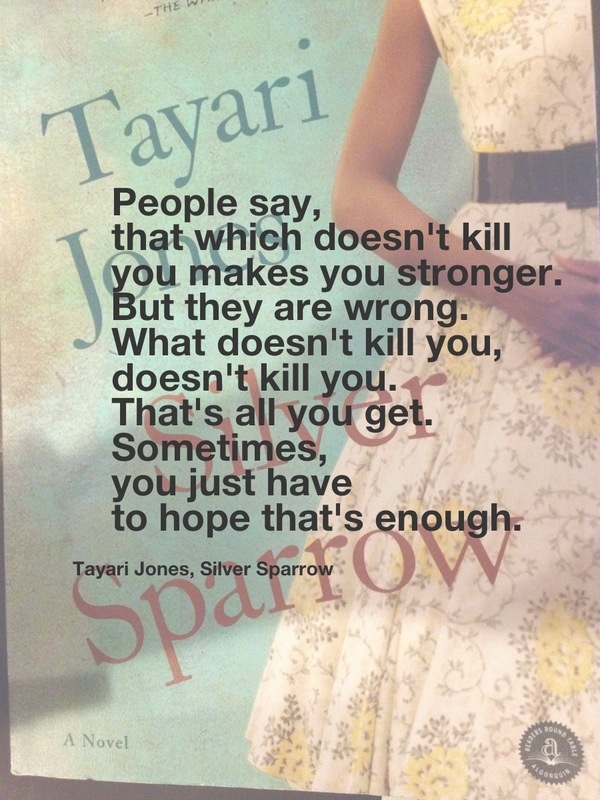 I just finished reading Silver Sparrow by Tayari Jones. Forget that book about the shades of gray, this book is all about the gray. There is no black or white clear-cut good guys or bad guys or women and girls in this book. It was not a hard book to read, but it was a hard read. Just when I’d decided where I stood on the characters and what was happening, the character telling the story changed and there I was again–in the Land of Gray. But that’s where we all live isn’t it? I’m glad I read the book, even though it frustrated me at times that there were no concise answers, good and bad. It made me think and feel emotions that I later questioned, and that part wore me out. Wesleyan alumnae were encouraged to read the book as part of the Pioneer Book Club. All of the first-year students were required to read it as part of their first-year seminar classes, so it was a way to connect alumnae to life on campus. I was motivated to read it because my oldest is a first-year there and mentioned that she thought the book was good. Then she finished it before me. Just finished “Silver Sparrow” and I’m sitting here about to cry in Starbucks. I think to say I enjoyed it would be an odd choice of words. It triggered some feelings for me, maybe because of stuff from my previous life. But yes, I’m glad I read it, and at some point, I would like to read something else by Ms. Jones. But it was when I came to the last paragraph in the book that I paused and gave thanks for having read it through to the end. (spoiler alert here) Because I know what she is talking about. I live there everyday. I know folks mean well, but sometimes people don’t need to hear about doors or windows that will open. Nor do I believe that things that are hurtful or sad or painful will make any of us a better person or a stronger person. Those things will shape who we are, yes, but for better or for worse? Who’s to say? So tonight I am thankful that someone else out there gets it. And maybe if she does, it is possible that there are others. Maybe I’m not as abnormal or mal-adaptive as I thought I was. Or maybe I am. Either way, I’m thankful for writers like Tayari Jones who write about the real shades of gray in this world and let those out there who hurt, who question, who doubt, and who are scraping by know that it’s okay NOT to feel stronger–they are not alone. It’s good to know bouncing back is optional. Well, perhaps in the context in which you are using it, I could say that is pretty apropos. 😉 The muscles will get stronger, right? But when folks say it to people who are hurting emotionally or who have suffered at the hands of someone else, I just don’t get it. I know that it’s hard and people don’t really know what to say. But I think it’s okay to say “I don’t know what to say.” Just my opinion. I saw a funny e-card thing that said “When someone says, ‘When one door closes, another door opens’ I say, ‘You might have a ghost. '” Or something like that. I had to laugh. Sounds as good as anything else. Thanks for reading and for sharing. Love ya. Sometimes that line between killed and not killed by the bad thing feels SO THIN. Oh good gravy the things we do to each other. I am so glad your friend had you to give her grace and the okay to feel empty. Nothing can make you feel worse than empty than hearing those platitudes offered up like that. Sometimes I’d be worried if someone wasn’t feeling like that in such a situation. I love what you shared you do. AG is one of my favorites too. Maybe when folks start talking like that, we should just holler, “Citizen’s arrest! Citizen’s arrest!” Thank you for reading and sharing your wisdom. You know I love you more than color tv. If there’s anything I can do for your friend, holler. “Then the iron door CLANGED SHUT!” That’s my favorite Barney line. The one I use around here QUITE A BIT is “Nip it. Nip it in the bud!” And I love any episodes that have Ernest T. Bass in them. And the Darlin’s.